AAHH Outreach Committee’s first adventure on Friday evening January 15, 2009 was a success. 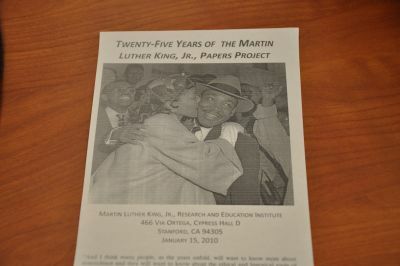 Stanford’s Martin Luther King Jr. Papers Project held an open house attended by over 200 guests included the AAHH Outreach committee of Mattie Tinsley, Robert Walker and Debra Scott. Mattie and Doctor Hoffman (co-founder, Martin Luther King Junior Association of Santa Clara County) discussed possibilities for the AAHH. Debra Scott promoted the AAHH by passing out brochures. Robert Walker took photo’s and video’s of the event which can be viewed on the AAHH Website.